Look at this! At Amazon.co.jp (Japanese Amazon website), I found a perfect gift for those longing for the life of a princess. This is not a miniature model but an actual full-sized carriage. 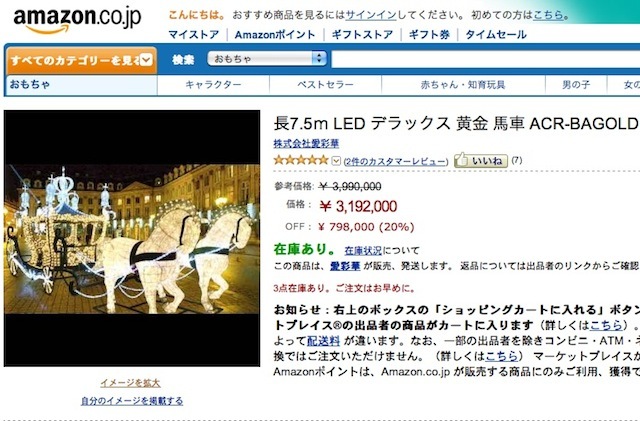 I didn’t know that Amazon Japan is selling real carriages (*_*)! The name of this product is “LED Deluxe Golden Carriage Illumination”. The length of the whole body is 7.5 m. It’s full-sized, and you can climb right in. But unfortunately, it doesn’t really move. Tons of LED lights are attached on the body, so the carriage (and even horses) twinkle beautifully. This carriage is straight out of a fairy tale. The price is ¥3,192,000 (US$39,845 /excluding shipping fee). A notable thing I have to mention is that this is the sale price! It’s 20% off! You can save ¥798,000 (US$9,961). Hmm. Is it still too much? You can’t afford it? Well… Then there is a smaller 3-meter long version selling for only ¥428,000 (US$5,342)! New Favourite Drink of Everyone?? Hot Fizzy Drink! !